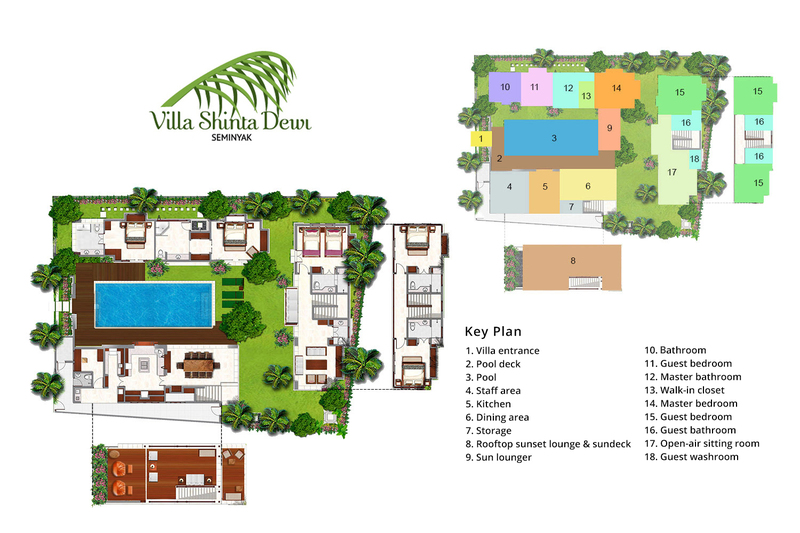 Villa Shinta Dewi Seminyak comprises a single-storey building and two double-storey buildings surrounding a pretty garden and 11-metre swimming pool. The layout was designed to allow for privacy, if preferred, or group gatherings. On one side is the master bedroom suite, a communal study/TV room and a small but well-equipped gym. Opposite this is a semi-open-air dining room and gourmet kitchen with a rooftop sunset lounge and sun deck above. Completing the set is the two-storey bedroom pavilion housing two rooms on the upper floor, and one on the ground floor alongside an open-air sitting room and guest washroom. An ulin wood pool deck borders the 11-metre swimming pool at Villa Shinta Dewi, furnished, at one end with four sun loungers arranged below large green sunshades. Upstairs, on either side of the sunset lounge are two sun decks, one furnished with fun brown and orange beanbag loungers, that look down over the pool and colourful garden. All four of the bedrooms at Villa Shinta Dewi are extremely well appointed, with marble floors, top-class amenities and superior comforts. Named after flowering tropical plants and trees, all are equipped with air-conditioning and ceiling fans, TVs and DVD players, set into handsome wall cabinets, bar fridges and safe deposit boxes. The Master Alamanda Suite enjoys pride of place on the ground floor next to the pool. This regal room will entice guests with its super-king-size bed and its soft green décor with splashes of red. Adjoining the bedroom is a dressing area and a bathroom fashioned in marble with a jacuzzi tub for two overlooking a heliconia garden and a romantic open-air rain shower. These two colonial-styled, timber-clad rooms are mirror images of each other, with king-size beds and window shutters that can be thrown open to enjoy views of the pool through the canopy of the garden’s tall frangipani trees. The Heliconia Suite is decorated in shades of orange while Frangipani is outfitted in green with elephant motifs. Built-in wardrobes showcase latticed sliding doors and ensuite bathrooms are fitted with rain showers. The Melati Suite contains twin beds that easily convert to a king-size. Elegantly furnished in green and mauve, it has two doorways, one leading out to the covered terrace and another providing a shortcut to the pool through the garden. There’s also storage space aplenty and an ensuite bathroom with a rain shower.